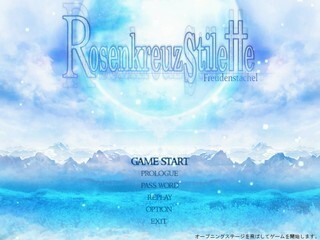 Released in October 2012, Rosenkreuzstilette Freudenstachel gives you more of what you loved about Rosenkreuzstilette, but is now twice as hard to pronounce. Best time: Single-segment 0:32:19.94 by 'Vucious Creed' on 2014-07-27. Best time as Pamela: Single-segment 0:33:58.25 by 'Senovit' on 2013-03-24. Single-segment: 0:32:19.94 by 'Vucious Creed'. This run was long coming. How long? I say about a year and eight months long, which would be about the length of time I've been running RKSF. This run improves upon the previous run by nearly 31 seconds thanks to a handful of new strategies and even includes a newly found skip that has never been done until now. This game has been dissected so much that this game has been put to the limit and beyond in my honest opinion. To note, this wasn't just merely a solo effort, this run contributes ideas and strategies from a whole community of people that even so much have touched the game. I'm going to keep the thanks a bit short, but I will, in general, thank all that were involved in the RKS/RKSF threads on SDA on the RKSF side of things. However, I would mostly like to thank my strongest rivals, 072 and bjw, for being the people that continued to push me to get lower and lower times. Without their hard work, this time would not exist. Also, special thanks to nate for the video rendering due to not having the equipment to do so myself so that this run could even get submitted. So without further ado, let's discuss this run for a bit. Luste's Stage ~ "Ultimate Sliding Test": In the tradition of the first stage being the hardest to run, this stage puts your sliding capabilities to the test early. Just about every slide and slide jump was executed near perfectly. Even getting the early cycle in the crusher section before the boss fight was generally simple. The fight against Lu... erm, "Heroe" could have been much better, though. Getting caught among the rising platforms is one of the most troublesome things to deal with, and of course, it happened in this run. Fortunately, the fight was done well enough that I could still keep going without any issues. Trauare's Stage ~ "The Only Skip You Need": The first several screens were pretty much trivial thanks to the Strudel's Flügel. Also thanks to it, "jetslides" are made available and was used pretty much immediately after that first initial Flügel ride. It's not too long after that one of the single biggest timesavers and stage improvements recently found, the Current Skip, was implemented and helped shave about six seconds in the stage. However, some of those time savings were lost due to some execution flaws near the end of the stage, but it was relatively minor in the long run. The Trauare fight was basically a cakewalk with nothing of note. Schwer-Muta's Stage ~ "Screw Shoe%": This is one of the more uneventful stages in general. Although, with that being said, this was still a very well executed stage with minimal errors. The slide jump out of the shortcut was done properly and Flügel fly towards the end went smoothly. Even the fight against Schwer-Muta, herself, was quite favorable. The warp pipe spawns were one of the best available, and Schwer was defeated with relative ease as a result. Zorne's Stage ~ "Burning Aggression": Not too much time was saved from the previous run. It was mostly just a more cleanly executed run with little mistakes. However, adding an extra jetslide during the vanishing block area of the stage helped dwindle down the time a tad. The fight against Zorne produced another favorable outcome as she gave the best possible attack pattern. Just to note, the only possible improvement could come from an extreme optimization strat that calls for extra slide jumps at the final set of flame pillars. You know, the ones that look like it was ripped off directly from the first Wily stage in Mega Man 1? Yeah, that one. Dolis' Stage ~ "Flying through the Forest": Not too much was changed from the previous run as all the general strategies were the same throughout. Most of which was simply using the Flügel to skip most of the stage anyway. Probably the only noticeable change is using the Strudel's Hund to make it up a ladder very early in the stage. The Dolis fight could have been better, but that's only because I was given the second best fight pattern (slide, then jump) which costs about 3 seconds as opposed to the best possible pattern (two jumps). Liebea's Stage ~ "Snow-Bound Wasteland": Once again, there was very little deviation in terms of strategies in comparison to the previous run. There may have been very minor changes in terms of slide usage and Flügel activation points that might have saved a few frames, if any, but overall, nothing major of note. The fight against Liebea went decently enough. Nothing worth mentioning as the fight pretty much went as expected. Sichte's Stage ~ "The Technical Clock Tower": This is one of my best stages in the run. Being one of the most technical stages in the game, getting a good-looking Sichte stage is very hard. Everything was near perfect from the Flügel fly in the area with the moving platforms to the long platforming area with the wind physics (of which had a slight route deviation compared to the previous run that saved about a second). The battle against Sichte also couldn't have gone any better with possibly the fastest possible kill (give or take a handful of frames). Grolla's Stage ~ "A Heavy Grind's Payoff": Even with how technical Sichte's stage is, Grolla's stage was probably the stage that I grinded on the most out of all the stages in the game, and as a result, this is another stage with some critical improvements. First off, a jetslide was added to the first Flügel fly in the stage. Next, I utilized a strategy that actually bjw, the previous run holder, first brought up, if I recall. By using a combination of the Weißteufel (time slowing weapon) and the Schneekristal (shield weapon) to first bypass the spear traps, and then destroy an undead torch Arthur-like enemy, I was able to blaze through the next few screens before the midboss. Another minor touch up was on Grolla, herself. In setting up Freudia after going through the final boss gate, she's in position to fire off one icicle right before Grolla jumps up for her initial attack. This allows that crucial 1 HP leeway for the Weißteufel's bullets to kill Grolla faster than just using the Weißteufel on its own. Eifer's Stage ~ "The Road to the Maze Skip": Eifer's stage, as a whole, was pretty solid. With a few better optimized strategies and a decently executed run, up to and including the Maze Skip, the stage went well. However, the fight against Eifer could have had better luck. After her first attack, Eifer used an ivy, then Eiferstachel pattern which wasted about a couple of seconds due to being forced to wait out both attacks in full. If the pattern was reversed, I wouldn't have to wait out the duration of the ivy attacks and finished the fight quicker, but that's boss RNG for you. Lecht & Rink's Stage ~ "I Hate Books": For the most part, this stage was done very well. Minor things like the first jump over the spike trap and major things like the jetslide in the first blackout section were executed flawlessly. However, then comes the rising books near the end of the stage. For some unexplained reason, I couldn't get one slide on them and were forced to walk up them and thereby wasted some time. (I still don't understand why the sliding inputs sometime drops on those platforms, but that's neither here nor there.) As for the fight against the Refraktia Twins: "No shooting mistakes? Quick-kill achieved." Schirach's Stage ~ "The Tremor of the Hammer": For the most part, not too much has changed from the previous run. This was yet one more stage where more optimized general movement saved a bit of time so there is nothing worth noting. As for Schirach, since she didn't drop rocks in a way that could have screwed me over, the fight was no problem at all. The only possible improvement is to utilize a jetslide on an upper pathway en route to the midboss, but the strategy is so precise that it's usually not feasible to attempt in a single-segment run. Pamela's Stage ~ "The End of the Black Cross": This was another pretty good stage. Most of the known strats in this stage were done as they were supposed to, especially the two jetslides after the midpoint. Barring a few movement flaws, the stage itself was fine. The fight against Pamela, on the other hand, was flawless. She gave the best overall pattern, and the rest was history. Iris Stage 1 ~ "The Un-Fought": The first stage of Iris' Castle was about somewhat okay-ish. The first half of the stage was very good, but the second half had a very notable mistake in which I failed to connect a jetslide which cost about a couple of seconds. However, the fight against a resurrected Graf Sepperin... what fight? Also, a jetslide strat in the first half of the stage was ignored for the same reason that the Schirach jetslide was passed up: not feasible enough to perform in a single-segment run, in my opinion. Iris Stage 2 ~ "The Devil Within": In what could also be a candidate for best stage of the run, the second Iris Castle stage was pretty much spot on. There were barely any movement mistakes at all, and about a second was saved around the midpoint by using a different strategy that yielded more optimized movement. However, the largest source of improvement came during the Dark Devil fight. The double jump that's required for the primary Dark Devil quick-kill was actually successful and saved around 4-5 seconds over the secondary quick-kill due to the time slowing effects of the Weißteufel which would have been needed for said secondary quick-kill if the jump failed. Iris Stage 3 ~ "The Rush and the Machine": This stage was nothing short of amazing considering that the RNG could have screwed me over many times during the boss rush. However, every single boss cooperated. The most annoying quick-kills, Grolla and Dolis, worked perfectly. Schwer didn't mess me up with bad pipe spawns, and Zorne gave the best overall pattern with the added bonus of performing a near frame-perfect shield activation upon teleporting into fight which saved a handful of frames. The Iris Machine II fight was also superb. With no missed or delayed Frostfackels, this rendition of the Iris Machine was no problem at all. Iris Stage 4 ~ "To Free a Friend": Since the stage is so short, there's almost nothing to say about it... except for swag Hund jump. Anyway, the meat of the stage is the Spiritia/Iris final battle, and both parts could have been better. The fight against Tia was visibly sloppy with unnecessary damage taken, whiffed attacks, and ill-timed shots during Tia's invulnerability periods. Despite that, the fight still felt quick enough that I paid no mind. The Iris fight, on the other hand, suffered from a slightly unfavorable spawn in which was hard to get the maximum hits on her with the weakness before moving on to the next attack phase. To note, it is possible to do so, but I was just unfortunate in not being able to. The only saving grace is the fact that Iris didn't spawn at the very top of the room which is THE WORST possible spawn point in the fight, so there is that. Overall, the final battles weren't good, but they could have been much worse, so I can live with it. Even though this game has been pushed to the brink with all the time saving strategies found, there is clearly still time that could be saved. Probably around the neighborhood of 10 seconds could still be saved, but that would require a tremendous amount of effort to shave off even a fraction of that time. So with that being said, I am perfectly satisfied with how this run turned out. So much so that I can finally let this run go. That is unless I feel the need to try to improve on it some more, but that is going to be a long ways off. Anyway, I hope that you all will enjoy the run, and until the next time, this is Vucious Creed/LV Creed signing out! Single-segment as Pamela: 0:33:58.25 by 'Senovit'. Only major time lost from execution was from falling off the platform in the first half of the Sepperin fight. This was probably somewhere in the neighborhood of 5-10 seconds lost, otherwise I'm quite happy with this run.